Ravi Saini1, Jyoti Budhwar2 and Sneh Kumar2. 1 Department pf skin and STDs, Government Medical College, Amritsar. 2 Sub-divisional Hospital, Dasuya, Hoshairpur. Man is always obsessed with fair skin since ages. Beauty, it is said, is skin deep. Not so anymore for consumers especially in India who demand from their beauty products more than just a superficial whitening of their skin tone for a short duration. Hydroquinone is the ?rst choice of topical bleaching agents used in treatment of melasma. It is widely prescribed by physicians and often used by patients without prescription. The principal adverse effects of its chronic use are confetti-like depigmentation and exogenous ochronosis. 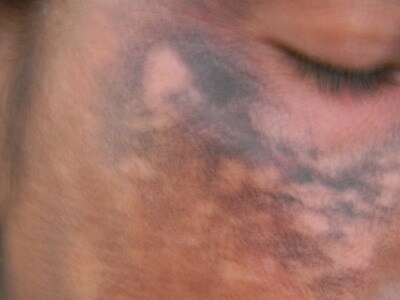 Exogenous ochronosis is an infrequent dermatosis characterized as a dark blue hyperpigmentation localized where the causing agent was applied. It may be caused by the use of systemic medications such as antimalarials and by the use of topical substances such as phenol, resorcinol, benzene, hydroquinone, which is a phenolic compound with depigmenting action. The pathophysiology of this process is not well clear up to this moment, and the therapeutic measures are not satisfactory either. We hereby, reporting a case of 29 years old female who had been using hydroquinone continuously for six years for fairer complexion and ended up with a night mare. 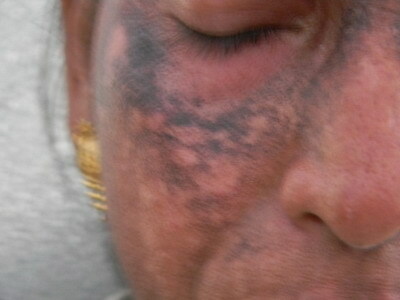 A 29 years old female, presented with progressive pigmentation of face starting since 6 years. She had been using topical hydroquinone 4% cream herself for whitish complexion daily on the recommendation of a beautician. Regular usage of cream for 2 years, lead to lighter complexion and she discontinued treatment but after 2 months of discontinuation, pigmentation reoccurred and she again started applying the same medication, but without any improvement. She continued using the cream after that, but pigmentation persisted and became more prominent. She consulted various dermatologists and was once diagnosed as a case of lichen planus pigmentosus and received treatment for that, but there was no relief. There was no history of drug intake, photosensitivity, any systemic illness, emotional stress or concurrent usage of other cosmetics on the face. Patient was given multiple sessions of radiofrequency ablation and topical treatment was also continued. After three sessions the patient got satisfactory response and lost to follow-up. Hydroquinone is an industrial hydroxyphenolic chemical, which inhibits tyrosinase leading to decrease in melanin production. Cytotoxic metabolites released during this process may further diminish the function and viability of melanocytes. Efficacy of hydroquinone as a topical bleaching agent is directly proportional to the concentration used. It is a common practice to use 2% cream or alcohol-based solution. Higher concentrations may be irritant and has a potential risk of phototoxicity and rarely, exogenous ochronosis. Nevertheless, hydroquinone is the most efficacious topical bleaching agent to treat melasma. Exogenous ochronosis is a rare but well-recognized side-effect of hydroquinone therapy. Exogenous ochronosis clinically presents as asymptomatic bluish-black pigmentation at the sites of chemical contact, common locations being face, sides and back of neck and extensor aspects of extremities. It often follows after initial lightening of pigment during hydroquinone therapy and is progressive if further contact is not avoided. [4,6] Resolution is generally slow after stopping the drug. Predisposing factors include olive or darker skin, failure to observe sun protection, prolonged usage of higher concentration of hydroquinone greater than 3%, continuous application despite irritation and vigorous inunctions into the skin. 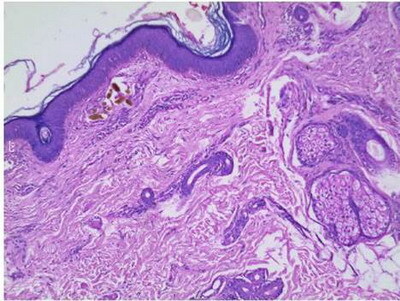 Diagnosis of Exogenous ochronosis is confirmed histologically with hematoxylin and eosin staining which reveal yellowish brown - pigmented bodies in the dermis that represent altered widened elastic fibers, as well as in macrophages, endothelial cells, apocrine glands, and epidermal basement membranes. The deposits do not lose their pigmentation after 3 days in 10% hydrogen peroxide. Furthermore, the ochronotic pigment reacts with all routine stains for melanin. Such deposits can also be seen in cartilage and elastic tissue. Dermoscopy has proved useful in exogenous ochronosis. In addition to melasma findings, dermoscopy reveals amorphous densely pigmented structures obliterating some follicular openings. Exogenous ochronosis is not an easy to treat disorder. Hence, its prevention is of paramount importance, which could be brought off in melasma by the usage of lower concentrations of hydroquinone, good sun protection, early diagnosis of irritation and discontinuation within 6 months, if there is no clinical improvement. Counselling of patient and explaining the consequences of prolong self medication of hydroquinone should be done prior to start of therapy. There is no substitute for adequate patient education and a meticulous dermatological follow-up. Treatment of Exogenous ochronosis consists of potent topical steroids, glycolic acid peeling, retinoic acid, azelaic acid, kojic acid, radiofrequency ablation, dermabrasion, cryotherapy, laser with CO2, ruby laser Q among others. However, the results are not satisfactory. The present case was quite exemplary of exogenous ochronosis. She medicated herself with hydroquinone topically for her whitish complexion without any medical opinion for almost 6 years. Exogenous ochronosis is a frequently missed disorder, which needs to be taken care of, in order to prevent, difficult to treat side effect, as a consequence of relentless use of hydroquinone. Patient education is a must regarding the use of over the counter drugs containing hydroquinone. 1. Findlay GH, et al. Ochronosis. Clinics in Dermatology 1989;7:28-35. 2. Charl?n, R., Barcaui, C. B., Kac, B. K., Soares, D. B., Rabello-Fonseca, R. and Azulay-Abulafia, L. (2008), Hydroquinone-induced exogenous ochronosis: a report of four cases and usefulness of dermoscopy. International Journal of Dermatology, 47: 19-23. 3. Montemarano A, Fulton J, Vinson R, Albertini JG, Gelfand JM, James W. Melasma. E-medicine Journal November 15, 2001; 2 : 11. 4. Grimes PE. 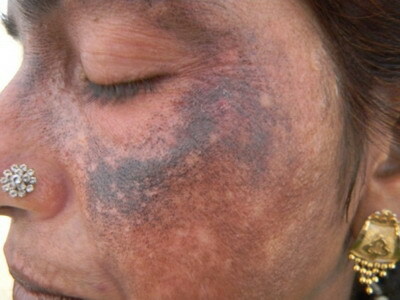 Melasma - Etiologic and therapeutic considerations. Arch Dermatol 1995 December; 131 (12): 1453-7. 5. Levin CY, Maibach HI. Exogenous ochronosis - An update on clinical features, causative agents and treatment options. Am J Clin Dermatol 2001; 2 (4): 213-7. 6. Findlay GH, De Beer HA. Chronic hydroquinone poisoning of the skin from skin-lightening cosmetics: a South African epidemic of the face in dark-skinned individuals. S Afr Med J 1980; 57 : 187. 7. David E, Rosalie E, Christine J et al. 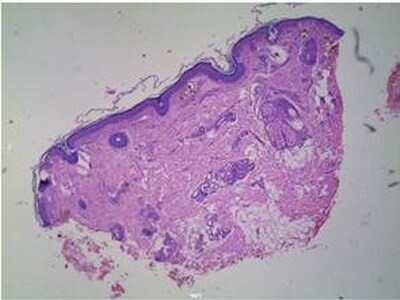 In: Lever's Histopathology of the skin. 8th edn. Philadelphia. New York: Lippinscott-Raven Publications ;1997:p.385. 8. Charlin R, Barcaui CB, Kac BK, Soares DB, Rabello-Fonseca R, Azulay- Abulafia L. Hydroquinone-induced exogenous ochronosis: a report of four cases and usefulness of dermoscopy. Int J Dermatol. Jan 2008 ;47(1):19-23. 9. Diven DG, Smith EB, Pupo RA et al. Hydroquinone-induced localised exogenous ochronosis treated with dermabrasion and CO2 laser. J Dermatol Surg Oncol 1990 November; 16 (11): 1018-22.